Art & Adventure are two of the strands that Christine-Ann Richards has successfully used over the years in planning her travels in China and central Asia. 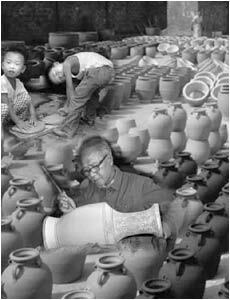 Her first visit with other members of the Craft Potters Association in 1978 has led to an on-going affair with the culture, the country and the peoples of China. This interest in the art, archaeology and philosophy that make up the history of the area have led to many a detour 'off the beaten track', which in her travels she seeks to share with others. christine ann richards, china, republic of china, far east, tours, ceramics, chinese art, chinese pots, pottery, ceramics, holidays, flights, potters association, pakistan, taklamakan desert, tours, guided tours, economy, christine ann richards, china, republic of china, far east, tours, ceramics, chinese art, chinese pots, pottery, ceramics, holidays, flights, potters association, pakistan, taklamakan desert, tours, guided tours, economy, christine ann richards, china, republic of china, far east, tours, ceramics, chinese art, chinese pots, pottery, ceramics, holidays, flights, potters association, pakistan, taklamakan desert, tours, guided tours, economy, christine ann richards, china, republic of china, far east, tours, ceramics, chinese art, chinese pots, pottery, ceramics, holidays, flights, potters association, pakistan, taklamakan desert, tours, guided tours, economy, christine ann richards, china, republic of china, far east, tours, ceramics, chinese art, chinese pots, pottery, ceramics, holidays, flights, potters association, pakistan, taklamakan desert, tours, guided tours, economy, christine ann richards, china, republic of china, far east, tours, ceramics, chinese art, chinese pots, pottery, ceramics, holidays, flights, potters association, pakistan, taklamakan desert, tours, guided tours, economy, christine ann richards, china, republic of china, far east, tours, ceramics, chinese art, chinese pots, pottery, ceramics, holidays, flights, potters association, pakistan, taklamakan desert, tours, guided tours, economy, christine ann richards, china, republic of china, far east, tours, ceramics, chinese art, chinese pots, pottery, ceramics, holidays, flights, potters association, pakistan, taklamakan desert, tours, guided tours, economy.